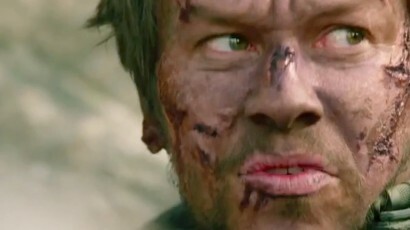 Mark Wahlberg stars as Marcus Luttrell who’s sent on a mission, along with his team of Navy SEALS, to capture or kill notorious Taliban leader Ahmad Shah, in late June 2005. Based on a true story and co-starring Eric Bana, Ben Foster and Taylor Kitsch, this film is a slow-burn roller coaster that takes its time to reach the action, letting the audience empathise with the characters before taking them to hell when the Taliban strike. So, just why should you invest time in Wahlberg’s character in Lone Survivor? Director Peter Berg and cinematographer Tobias A. Schliessler shot the movie with a Red Epic camera getting the audience right in the middle of the action, following Steven Spielberg’s Saving Private Ryan and Ridley Scott’s Black Hawk Down visual style. The central set piece is a fantastic never-ending action sequence that not only endangers the characters, but also leaves you out of breath and gasping for air. [SPOILER] It comes to a point where the protagonists, surrounded by Talibans and with only a long fall down a cliff as a way to escape, jump off in an heroic slow-motion shot. A classic action hero moment that soon will be forgotten when a more realistic, harsh visual style storms in with real speed. It will makes you cringe as you feel every rock the characters smash against on their way down. In the same way Gareth Evans’ The Raid films make you feel the action in your body, Lone Survivor action sequences put you through the pain of a battle. If you watched this on the big screen, you probably experienced the best sound mixing in the movies of the past year. Watch it now on your home cinema system and you might notice even more the outstanding sound mix that Lone Survivor offers. With a frontal sound mix during the first act of the film, as soon as the shooting starts and the actions kicks off, the surround sound goes wild. The sound of bullets will fly all over your house making your neighbours wonder whether they should call the police. As sound editor Wylie Stateman has discussed in several interviews, their goal was “to put the audience inside of the frame”. When a character comes in he is not just presented in the central frame; first the audience can hear his steps coming closer, his clothes moving, etc. But not just the explosions and shots surround you while watching the film; disrupted radio signals, dialogue between characters, everything is carefully planned to enhance the experience. As much pain as the characters suffer, and right until the point where they start sweating blood, they keep fighting, they never give up and they never, ever, leave a man behind. There is a huge motivational message in Lone Survivor. No matter how bad the situation is; no matter how tired, frustrated, angry or weak you feel, you should never give up; you should stand up again every time you fall. Because as Mark Wahlberg’s character says during a climatic moment in the film, “You’re never out of the fight”. We all like real-life stories, out of the ordinary experiences that actually happened and that make us feel something real from the safety of our sofas, especially if the story has a powerful message. It could be a motivational message that makes us realise there’s greatness in ordinary people. But it could also be a real story with a feel-good factor. Lone Survivor offers a bit of both, and so, the result is a compelling, thrilling experience. And, of course, we can always learn something from a true story and this film offers the chance to learn about the Pashtun people and their customs. After most of the action has passed, and the pace slows during the final moments of the mission, we meet the Pashtun villagers. While Wahlberg’s character tries to recover his strength and heal his wounds, the story presents a Pashtun child. Through his eyes, his actions and those of his father, we learn about the moral code that the Pashtun people live by and how they defend any guest they have in their home, even with their own lives if necessary. A truly emotional turn of events that will tug at your heartstrings.